NOTE: Most pictures in this section may be enlarged by clicking on the picture. Unless indicated otherwise, all pictures are courtesy Louis Conradie. My brother Louis visited the Rehoboth museum on 6 May 2009.
photo: Museum web - On my behalf Louis focused on the outdoor display of some railway relics. These are just visible behind the tree on the left in this picture. Obviously a section of 600 mm narrow gauge track. Two very strange items of rolling stock - obviously to transport some kind of fluid we could quess! photo: Lichtbildstelle der Bundesbahndirektion Nürnberg Germany. This is Staatsbahn Krauss tank locomotive No. 119 with water tender No. 14 - originally this tender had a volume of 3 cubic metres, but the tender was later converted to hold six cubic metres. Water of course!!! The answer came when I studied some old pictures. These items were auxiliary water tenders for the narrow gauge steam engines. These water tenders did not all have the same capacity. The smaller one could take 3 cubic metres of water, and the larger one was double that capacity. photo: Lichtbildstelle der Bundesbahndirektion Nürnberg Germany. This is engine DSWA Staatsbahn Class Krauss tank locomotive N0 106 with water tender No. 9. Note the brakeman's seat. When in transit, these little trains had a brakeman in attendance on each carriage to work the brakes of his unit. This photo is only titled "Bahn ins Innern" (Railway in the Interior). It appears to show loco's 178A & B heading the train. The first truck is the water tender, of which two examples can be seen today at the Rehoboth Museum. The Staatsbahn, a narrow-gauge (600mm) railway line, was built from Swakopmund to Windhoek between 1897 and 1902. From 1901 to 1904, twelve side-tank locomotives, numbered 101 to 112, were commissioned. They were built in Germany by the Krauss Company of Munich, and fitted with Stephenson link valve gear. Follow-up batches (No's 113 to 116) were built between 1904 and 1905 by Arnold Jung, Jungenthal, with Heusinger valve gear. Numbers 117 to 120, commissioned in 1905, were built by Orenstein and Koppel of Berlin and fitted with their own valve gear. Because of the inefficiency of the latter valve gear, it was replaced with Heusinger valve gear at a later date.. The wheel arrangement was 0-8-0, with a driving wheel diameter of 600mm. The boiler pressure 12 atu (1214 kPa), the cylinder diameter 240 mm and the engine performance 60 HP. Modifications to the locomotives were done at the Karabib railway workshop. For example, the mechanism of the coupled wheels was provided with cover boxes to protect them from sand storms and prevent hot boxes and the injector originally fitted in the cab was relocated outside to the frame to ensure better functioning. When the Umbau project, to widen the Swakop-Windhoek line to Cape gauge, was completed, these narrow gauge engines became redundant, therefor they were available for other uses, such as on the Rehoboth town railway. Die brakeman's seat (a bench) was on top of the tender on the nearest end. The brake handle and shaft is missing, but the part with the two holes for the shaft is still in place. photo: Lichtbildstelle der Bundesbahndirektion Nürnberg Germany. This is Krauss locomotive No. 104, a very near sister of the No. 103 which was used by Georg Bräuer on the Rehoboth town railway - see last black-and-white picture down below. This is the only name which appears on the tender. "Roechling. 12. 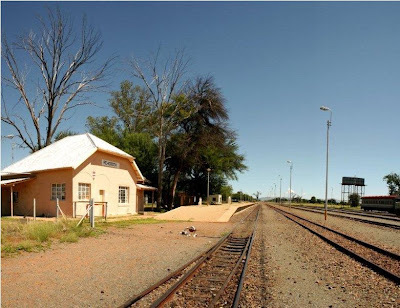 W."
In 1910 the German colonial authorities started to build a railway between Windhoek and Keetmanshoop – the North-South line. The Cape gauge (3ft 6 inches) width was used and this reached Rehoboth station at kilometer 98. This station was 12km from Rehoboth town and passed the town in the interest of cost savings. 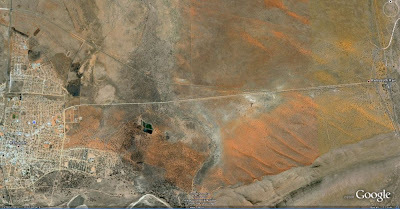 Google Earth view: Rehoboth town is on the left, and Rehoboth station is 12 km to the East. Click on the picture to enlarge. 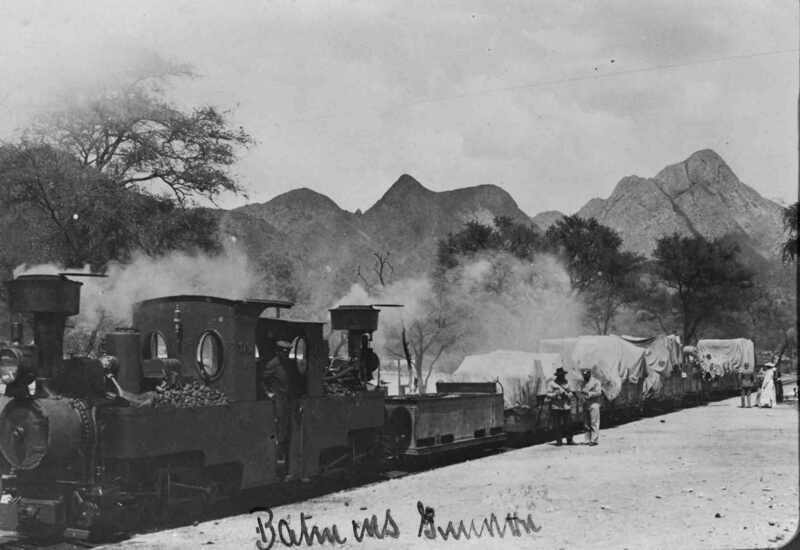 On 1 July 1912 Dr Solf, the colonial state secretary, on a personal visit to Rehoboth, wrote that a town railway was necessary for Rehoboth, as both their vehicles from Windhoek, had got stuck in deep sand on their way to visit Rehoboth. The State therefore built a 12 kilometer narrow gauge (600 mm) railway line from the Rehoboth station to Rehoboth town. The line was leased to German Shutztrooper a Mr Georg Bräuer who operated it privately as a town railway for Rehoboth. 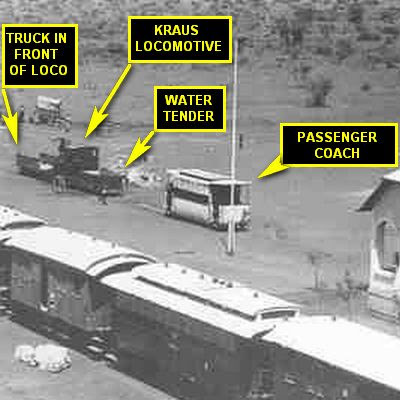 He purchased 3 Krauss tank locomotives, one first class passenger coach, one second class passenger coach, 3 goods wagons, and 2 twin axle trolleys. Mr Bäuer got all these items from the redundant stock from the old narrow gauge State railway. 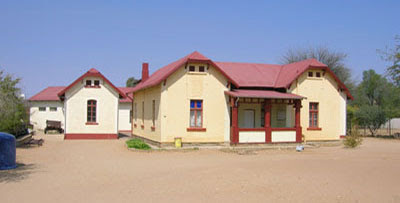 Rehoboth Station as photographed by Louis Conradie on 14 Feb 2010. Rehoboth Station as photographed by Louis Conradie on 14 Feb 2010. The old "Bahnhof [railway station] Hotel" is the blue building in the background. 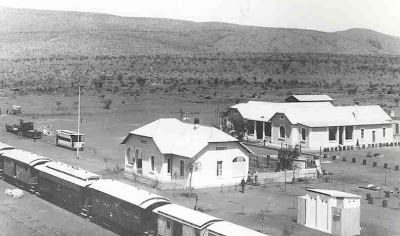 photo: Windhoek Archives - Rehoboth Station around 1913 to 1915. The picture was almost certainly taken from the station's water tank installation. 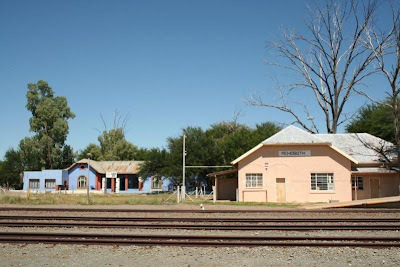 The Cape gauge train is nearest on the Windhoek-Keetmanshoop line, and in the far left some units of the rolling stock of the Rehoboth town railway are visible. Crop of previous picture identifying some of the detail. The Rehoboth rail service was introduced on 15 January 1913 and passengers and goods were transported to and from scheduled trains at Rehoboth Station with regular connections to the town. Unfortunately the WW I interrupted the operations of the town railway. The Basters had learned their lesson from their previous experience with their German masters and now refused to ally themselves and fight for the German cause. They viewed the conflict as being a 'White Man's War'. The Germans did not respect the neutrality of the Basters and declared war on them in March 1915. The Basters abandoned the settlement at Rehoboth and fled about 80 km westwards to the hilly and better defensible lands known as Sam Kubis. It was here that they waged a guerrilla style defense from the hills against their German foe. They held their lines until 8 May 1915 when the Germans had to make a tactical retreat owing to South African Union Forces taking command of the area. On 9 May 1915 the German troops retreated to Rehoboth, and soon afterwards retreated towards Windhoek. It would have been around this time that locomotives of the Rehoboth town railway were destroyed. Thus the Rehoboth town railway only operated with steam traction for about 2 years and 4 months. photo: Walter Rusch Private Collection: Destroyed Krauss locomotives No's 103 & 111 of the Rehoboth town railway at Rehoboth station. The firebox doors & wheel driving shafts are missing. The nearest locomotive has its paint pealing off, possibly because the engine's remaining fuel (coal or wood?) was set on fire. After WW I, the town railway operated again, but rolling stock were drawn by mules. In 1933 the line was finally broken up by the South African railway authorities - by this time Rehoboth had a regular SAR road service. The rolling material remained in the sand for many years. Eventually the rolling stock was dismantled by local farmers, and the different parts were put to good use again. The passenger coach finally came to the end of its life, being used a storage place for flammables, when it exploded in 1945. Eventually the two steam locomotive tenders and a section of narrow gauge rail were put on display at the Rehoboth Museum. NOTE: Rusch and Dierks are in conflict on some aspects of the town railway history, for instance Dierks states the the Germans, out of respect for private property, did not destroy the Bräuer locomotives, when they pulled back before the fast approaching South African troops - however, Rusch provides photographic evidence that the locomotives were indeed destroyed, and could never be used again. The exact number of locomotives (2 or 3) and coaches (1 or 2) purchased by Brauer is also in dispute. 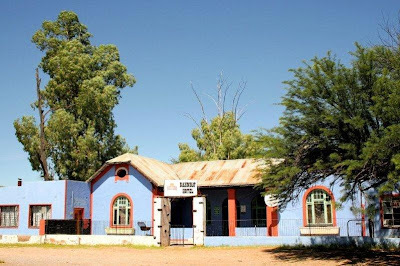 "The line from the standard gauge railway station at what was known "Rehoboth Rail" to the village of Rehoboth, some 12 kilometers to the west, was a municipal railway of an entirely different kind. This line was built by the Government, construction having been begun in 1909 and completed in 1911. Bids were invited for its operation by private individuals and Herr Georg Brauer was the successful bidder." "To operate his new acquisition, Herr Brauer purchased two 0-8-0 tender locomotives, three or four bogie lowsides, and a composite first and second class coach from the Government. This equipment was some of that stored at Karibib when the O.M.E.G. took over the Swakopmund-Karibib service and that part of the Swakopmund-Windhuk line practically closed down. In addition, several small 4-wheel platform cars were procured, and with this meager amount of equipment, which proved quite adequate, the line began business." photo: old photo album in possession of the Brauer family. This photo shows quite a bit of the Brauer railway stock. The building ("Bahnhof Hotel") in the background was located behind the station building at Rehoboth Rail (see a few pictures higher up). In the foreground the Cape gauge rails of the North South line between Windhoek and Keetmanshoop are visible. The "Bahnhof Hotel" building (compare with previous old photo) as photographed on 14 Feb. 2010 by Louis Conradie - currently it is a private residence, but all the notices relevant to the hotel years like the star grading, liquor notices and "ring the bell" are still on the front porch. "Only one locomotive was in steam at a time, the second being held in reserve at Rehoboth. If a second train had to be sent out for any reason, it was horse drawn and consisted of one of the little 4-wheel platform cars. As there were no intermediate sidings and a meet had to be arranged, care was taken that it took place at one end of the line or the other. Eastbound traffic was negligible while that westbound consisted mainly of supplies for the Brauer store at Rehoboth and oats for a stud farm at Maltahohe. In addition to the store at Rehoboth, the Brauers owned and operated a hotel at the Rehoboth Rail station." "The little railway was certainly no gold mine but it must have paid expenses or have been an absolute necessity as a means of moving freight west from the standard gauge. It was part of the agreement with the Government that a connection had to be made with every train, prospective passengers and freight or not." "Being state owned, the Rehoboth line was subject to yearly inspections of personnel and equipment and these inspections were not cursorily performed, far from it. The inspectors took their duties very seriously. The railway physician was Doctor Weisske at Windhuk, a very careful and conscientious inspector of the human element connected with the line and each year Herr Brauer, and each and every one of his employees who had anything at all to do with the Rehoboth Municipal Tramway, traveled up to Windhuk to be gone over as thoroughly as was the equipment." photo: old photo album in possession of the Brauer family. "After the Campaign of 1915, Herr Brauer was reduced to hauling his passengers in an ex-State Northern open wagon fitted with a garden seat, with mules as the motive power." My brother Louis has followed up on this Okapuka Ranch relic, but he is pretty sure that this rather rusty specimen has been removed from the farm - its present whereabouts unknown - it is likely to have seen a long time of active service as a water reservoir on the farm. I would have liked to see these items (the locomotive boiler in the background too) moved to the railway museum in Windhoek. I have tried to contact the owners of the ranch to get more on the history of these items, but unfortunately had no response. The locomotive relic in the background appears to be the same class as the loco plinthed in front of the Tsumeb Museum. The First 100 Years of State Railways in Namiba, by Brenda Bravenboer & Walter Rusch, Transnamib Museum, Windhoek, 1st Ed. 1997. NAMIB NARROW-GAUGE (2nd ed.) - Sydney Moir & HT Crittenden, 1982 by Junus Publishing. I was referred to your site by Pierre de Wet and am delighted to find your well presented account of a fascinating piece of history. I have fond memories of the Rehoboth area having worked at the Oanob Dam in the 80’s. Then, the tenders were lying unpreserved together with the section of track in the yard of the museum in Rehoboth. Thank you for this useful web resource. I was a Station Foreman at Rehoboth Station from November 1977 until January 1979. Good old days.